The exhibition consists of two works by Asumi Mizuo and Akiko Diegel displayed together as an installation. The space is filled with hand made slippers arranged on the floor and interspersed with displays of mended pottery. As well as being beautiful aesthetically the works each respond to Japanese traditional forms transplanted and interpreted in New Zealand materials. 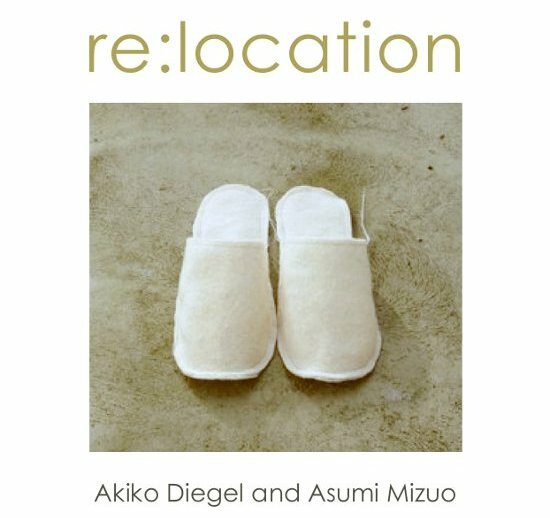 Diegel's traditional Japanese slippers are made from New Zealand wool blankets and Mizuo's cups are broken Crown Lynn pottery mended in the style of Japanese Kintsugi gold lacquer repair. Through this delicate treatment of everyday objects the artists present a thoughtful and approachable commentary on what it means to exist with a foot in both Japanese and New Zealand cultures. Before becoming an icon, collectible and almost valuable, Crown Lynn has held nostalgic and sentimental value for those who grew up eating and drinking off them, and saw the fall of domestic industrial production. As recent migrant to New Zealand without “legitimate” nostalgia or sentiment for the tableware, I intervene into its history, and, the intervention resurrects its use and highlights or glorifies the history, the damage and the disownership. The project questions the issue around exoticism; Orientalism, Occidentalism,self‐exoticisation, commodification, consumption, etc. Exoticism has such negative connotation among artists, critiques and art historians. Maybe it is an expression of guilt of colonisation; comodification, objectification and consumption of “others”, or the uncomfortableness that everyone, more or less, employs some kind of exoticism to promote oneself. Yet exoticism is a longing or adoration for something new, never‐seen‐before, unknown, unfamiliar, unusual things that are fundamentally unattainable. Used blankets often bring back lost memories. They trigger many emotions including nostalgia, sentimentality and melancholy. They surround us with lost personal and cultural stories waiting to be told. They serve not only as protection from our anxiety but they are also a sign of labour, through their painstaking production, and a physical embodiment of multiple lost histories, through the exchanges and uses they have been put through. Dismissed events are often ignored yet contain many precious morsels of information that should be embraced. There is great fascination in investigating whether events that occur on an entirely unconscious level can be transformed into significant events through a conversion process into a different medium. One should always be encouraged to explore forms and materials that would normally be overlooked in order to see if changes to the form might increase their value because of the alternate perspectives it allows. Synchronously it is interesting to question how fragility, and the use of materials that are bound to fail, can be utilised and how their possible applications in art practice communicate value in a different manner. Repetition can be seen as the re-telling of an event in the same words by a narrator, or as the use of the same discourse elements to narrate different events. But the growth of a work, even from one line to a supposedly identical one, makes exact repetition impossible. Except in the context of progression, any repetition taking place in advancing time is not describable. Does this indescribable process of progression by repetitive activity emphasize the event of action and reinvent the importance of human facility? Re:location is based on an exhibition originally developed and shown in Auckland at room 103 . Many thanks to the curators and organisers.